The Suzuki Vitara is the best-selling vehicle in Hungary in October. New car sales in Hungary manage to edge back up into positive territory in October at +5.4% to 10.923 registrations, a ratio it replicates year-to-date at 115.549. 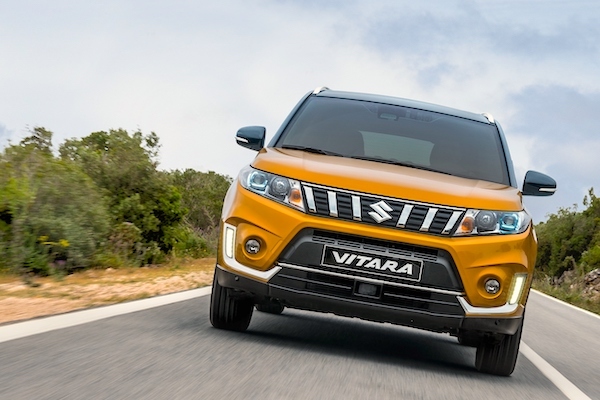 Brand leader Suzuki (-4%) hasn’t quite recovered from pre-WLTP just yet, also penalised by a slow changeover of the facelifted Vitara, but remains solidly in the lead at 13.5% share, distancing Ford (+10%) just as Toyota soars 42% year-on-year to hit a round 10% share in third position vs. 7.8% and #6 YTD. Dacia (+43%) up to #5, Nissan (+35%) back up to #8, Kia (+21%) at #9 and Skoda (+12%) also post fantastic results in the remainder of the Top 10 whereas Volkswagen (-45%) and Opel (-25%) struggle mightily. Model-wise, the Suzuki Vitara (-2%) is back in charge after a weak September score ahead of the Skoda Octavia (+27%) and Suzuki SX4 S-Cross (+27%), replicating the YTD podium while the Dacia Duster (+26%) and Fiat 500 (+63%) also post outstanding gains. Finally, at #10 notice the Toyota C-HR scoring its second ever Top 10 finish after last January (#9). Full October 2018 Top 10 brands and models, January-October Top 70 models below.